Whitehall Personalized Arch Shape Lawn Plaque - - is an impressive addition to your front yard or garden. Made in USA. Includes up to five large 4.5 inches high number, the street name, and two lawn stakes. Standard-size Arch lawn plaque measures 15.75" x 9.25". Characters on line 1 are 3"; characters on line 2 are 1.25". Includes one 18" stake. Estate-size Arch lawn plaque measures 23.75" x 14". Characters on line 1 are 4.5"; characters on line 2 are 2". Includes two 18" stakes for convenient set-up. Each plaque is crafted from rust-free recycled aluminum. Paints have been specially formulated and weather tested to withstand the harshest elements. Made for you in the USA. Line 2 holds up to seventeen (17) characters. GG green plaque with gold characters (large image--shown in standard size). Small images (from left to right) all shown in estate size: AB antique brass; AC antique copper; BG black plaque with gold characters; BS black plaque with silver characters; BW black plaque with white characters; GG dark green plaque with gold characters; OB oil-rubbed bronze; OG bronze gold; PS pewter silver; RG red plaque with gold characters; and WG white plaque with gold characters. 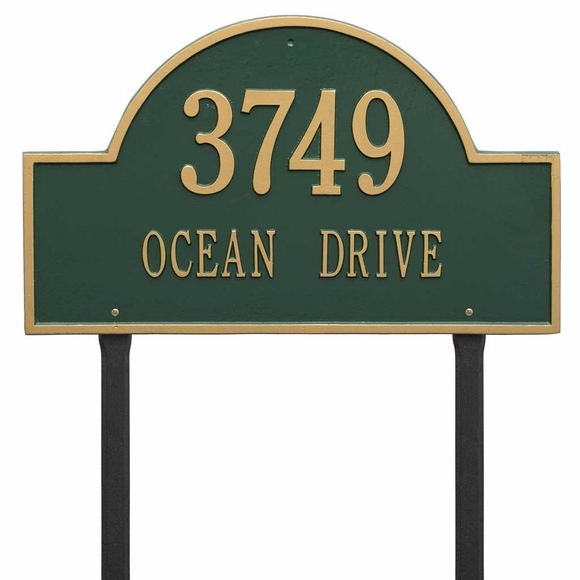 Upgrade your landscape with a lawn mount address sign.